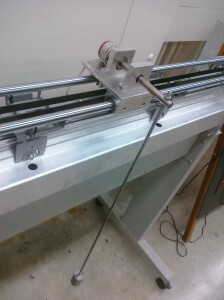 From what was learned with last semester’s inverted pendulum, is that stability of the test fixture is as important as the control code that we will be testing. 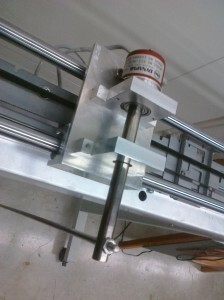 All the previous flaws of the inverted pendulum were taken into account when creating the newest version of it for the mathematical modeling and control portion of the SDS project. The newest pendulum features a long rod with an adjustable mass, to simulate shift in the center of gravity that the vehicle would experience both with and without a rider. Additional features include, a high resolution relative encoder, self reversing limit switches (to prevent over-driving the carriage), and linear slides that were generously donated by IGUS to ensure smooth operation of the rail system. With the hardware complete we can now begin modeling and testing control code. Since the balancing of the inverted pendulum was needed for a controls class that some of us were taking it was important to get upward stabilization to work properly. Below is a Video of what was presented for the controls class. 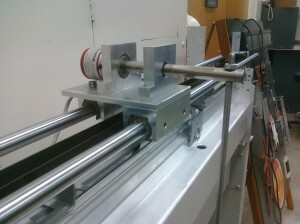 As seen below we were able to keep the cart moving and the pendulum balanced simultaneously.